Achieve a Straight, Functional and Beautiful Smile Today! When it comes to smiles, people generally consider a straighter smile to be more attractive and associated with success. Furthermore, straight teeth are easier to clean and less likely to cause negative symptoms later in life, including enamel erosion and jaw pain. At San Pedro Smiles, you aren’t just getting any orthodontic treatment; you’re getting a fully-catered procedure that meets your needs from the moment you walk in for your first appointment to when the braces come off. Getting started is as easy as contacting our office to schedule a consultation! Dr. Justin Gonzalez can’t wait to meet you and discuss your new smile journey! Braces use brackets and wires to shift teeth slowly over a set period of time. 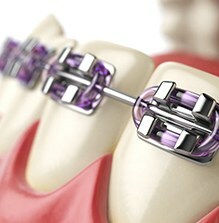 A bracket is attached to each tooth and arch wires are then threaded into each of the brackets. These wires are tightened every time you come in for an orthodontic appointment, which is what cause the teeth to shift and permanently set after they’ve been adjusted. Gentle and controlled pressure is an essential part of any orthodontic process, whether it be for metal braces or any other treatment. If you have a poor bite, you may need to wear bands that wrap around brackets on the top and bottom arches for additional correction. The treatment time for metal braces can be anywhere from 18 to 36 months, depending on the complexity of your case. For example, shifting the entire bite generally takes more time than simply removing gaps or straightening teeth. If you have gum disease, you’ll need to have it treated before the hardware is placed. If you need other preparatory procedures such as a tooth extraction, that can also influence treatment time. Keep in mind that after the braces come off, patient compliance plays a role as well. All orthodontic patients need to wear a retainer to allow the support gum and bone tissue to fuse, therefore holding your teeth in their new position. Am I a Candidate for Traditional Braces? All patients interested in adjusting the position of their teeth should start by having a consultation with the dentist. They can help you determine which orthodontic treatment is best for you, the complexity of your case, and your payment options. If you find it difficult to use clear aligner trays or have severe jaw bone or bite issues that clear aligners cannot correct, metal braces are likely perfect for your case! 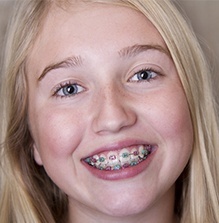 Our practice is fully experienced to help young patients transition to life with metal braces. 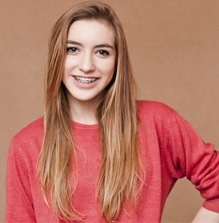 Not only will they get valuable advice on managing care at home, but they’ll get the chance to customize the look of their braces through multi-colored bands that wrap around the bracket. Whether you’re a younger or older patient, metal braces in San Antonio have the potential to change your smile forever. Don’t hesitate to contact Dr. Gonzalez’s office today to speak with a team member and get started on your smile journey!